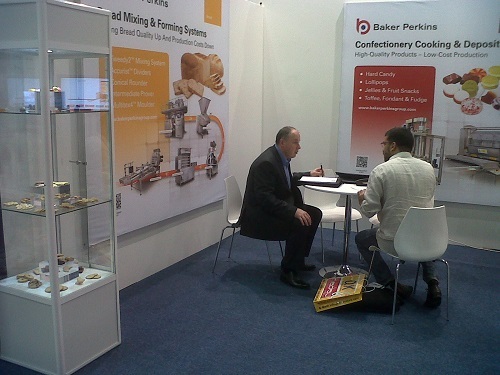 Baker Perkins highlighted its process and product innovation capability for the cereal sector at Gulfood in Dubai, February 25 to 28, 2013 (Sheikh Saeed Hall – UK Pavilion). Baker Perkins Cereal Master™ systems incorporate designs for both extruded and traditionally cooked cereals. Twin-screw cooker extrusion is a reliable and versatile process. In its standard form the Baker Perkins SBX Master™ extruder produces conventional direct expanded cereals using corn, rice, bran, wheat, barley or oats. A range of post-extrusion forming techniques are available as part of the Cereal Master EX™ system to add value and variety to extruded cereals. These may be purchased with the extruder or added at a later date as business needs and customer tastes change. For example, a line producing direct expanded cereals such as corn balls, multigrain rings and alphabet shapes can be extended in stages to make a range of higher added-value products with sophisticated taste and texture combinations. Co-extrusion equipment, flaking rolls, shredders, toasters and cereal cookers are available enabling high added value cereals such as flakes, filled pillows and multigrain products to be made from the same standard extruder. A coating system adding value through frosting or glazing is a further possibility. The principle of expandable lines is also applied to traditional cereal processes in the Cereal Master TX™ system. Based on rotary steam-cooking and flaking of grains, the standard process can be extended to incorporate a wide variety of single and multigrain flake products with either a frosted or glazed coating.